Sydney Modern Quilt Guild and Wollongong Modern Quilt Guild are proud to present the 2019 Modern Quilt Show Australia! 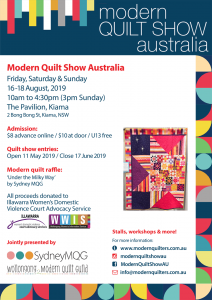 After a break in 2018 we’re teaming up to bring you another fabulous show, featuring the best modern quilts in Australia. We’ll be returning to our beautiful venue from 2015 – The Pavilion, Kiama. Australia’s 1st Modern Quilt Show was founded and presented in Berry NSW during May 2014 by Wollongong Modern Quilt Guild. The following year Modern Quilt Show Australia 2015 was once again hosted by Wollongong MQG, this time in beautiful Kiama. Error: Error validating access token: Session has expired on Thursday, 31-Jan-19 03:34:54 PST. The current time is Tuesday, 23-Apr-19 04:51:52 PDT.